Here is a good news for the people who wish to buy a DTH at their home. Nearby is providing Tata Sky HD at an amazing price starting Rs.1,199. You get a free 1 month subscription also in the offer. I am using Tata Sky DTH service for the past 3 years. I would say that it is an amazing deal to grab. IMPORTANT UPDATE - Get extra 25% off with coupon code FUN25. Grab it before it is gone. Extra 1% discount when you pay with PayUMoney. Tatasky SD with 1 month free Subscription. Tatasky HD with 1 month free Subscription and HD Access. This includes a Kit value of Rs.599, First time recharge for activation: Rs.1201, HD Access fee of Rs.175 and Package Recharge of Rs.250. 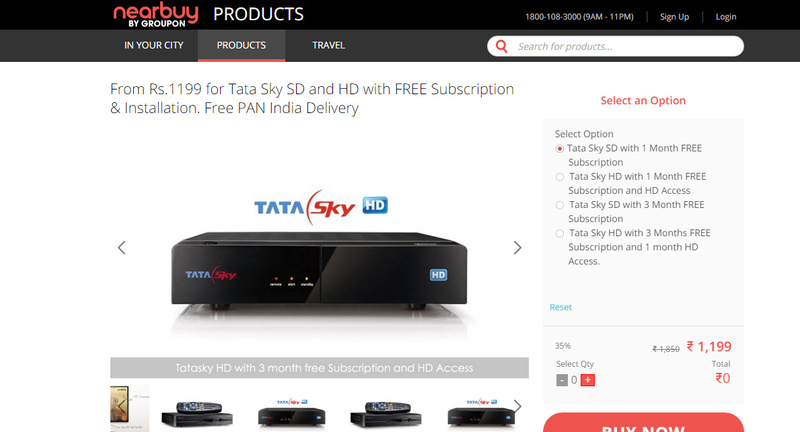 Tatasky SD with 3 month free Subscription. Tatasky HD with 3 month free Subscription and 1 month HD Access. This includes a Kit value of Rs.599, First time recharge for activation: Rs.1201, First month HD Access fee of Rs.175 and three months Package Recharge of Rs.250. Free Installation within 4 working days. Subcription free for month includes Dhamaal mix pac worth Rs 250 pm. No Cancellation and No Refund. Product comes with a warranty which is valid for 12 months post purchase. Their Returns/Replacement Policy is applicable. Delivery Timeline - Within 4 days of order. Tatasky team will get in touch with you within 4 working days of purchase and get the installation done free of cost. Standard installation includes 10 meter wire per box. If additional wire is consumed it is charged via recharge. Here is what Tata Sky says about the product. Tata Sky HD takes TV viewing to a whole new level with enhanced viewing experience. Exciting services such as Active Services, Showcase, Pay-Per-View movie service. Tata Sky DTH also gives you the luxury to select the shows of your choice through innovative packaging offerings such as Tata Sky Make My Pack and TruChoice.